A near sellout field shared in over $35,000 in scholarships awarded in singles, doubles, and team divisions at the 2017 Junior Bowlers Tour's Las Vegas Main Event, held at the incredible South Point Bowling Plaza. Although bowlers from 23 states competed, Californians took a large share of the biggest spots. The coveted scratch singles crown was earned by 15 year-old Solomon Salama, Los Angeles CA, who beat fellow Californian Nick Postag 246-237 in a very well bowled match. Salama, who is now by far the youngest to win the scratch event, earned $3,200 for first, while Postag added $2,000 to his scholarship total. Girls scratch singles came down to the final frame, as a tenth frame open proved to not hurt champion Maranda Pattison, Redwood Hills CA, who beat Crystal Elliott, Melbourne FL, 187-179 for the title and $1,500 scholarship windfall, while Elliott settled for $1,000 for runner-up. 12 year-old Kaitlynn Yukihiro tried for the singles sweep for the golden state, but Kristy Mace, Vail AZ, won four matches in the finals including a 224-208 win over Kaitlynn in the finale, to win the handicap singles and whopping $2,500 top prize. Yukihiro, Yorba Linda CA, earned $1,500 for the second place performance. 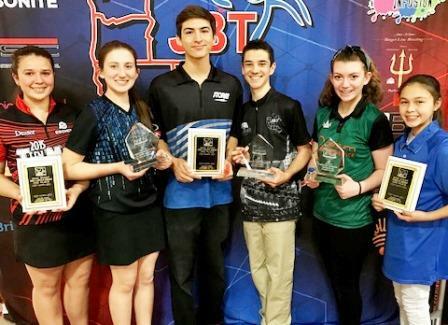 For the second straight year a boy-girl team earned the scratch doubles title, as JR Mehlum's tournament high 801 series carried him and Saralyne Nassberg to the win and $1,000 top prize. Washington bowlers Jacob Frazier and Lailani Wallin captured the handicap doubles crown with a 1433 total and $1,000 as well, the only team to crack 1400 in the division. Salama also shot one of the event's five 300 games, joined by two-time defending champ Wesley Low, and JBT stars TJ Rock, Jacob Mullen, and Deo Benard, each earning $100 bonuses from both JBT sponsor MSC Inc and South Point. JBT's title sponsor Ebonite awarded balls during each singles block, and our other terrific sponsors and vendors were integral in helping award the very large scholarship total.